Correa reflexa is a species that occurs in every state except Western Australia. Growth habit, foliage shape and flower colour all differ dramatically across the range of this species. Perhaps in the future these differences will provide fertile ground for a botanist to split Correa reflexa into many new species. To those interested in the forms of Correa reflexa we would recommend Correas Australian Plants for Waterwise Gardens by Maria Hitchcock, a life member of APS. This is a splendid publication covering all aspects of the history, identification, propagation and cultivation of this unique Australian genus. We will confine our descriptions to a couple of forms of Correa reflexa that are native to the Northern Tablelands of New South Wales. We have a form of Correa reflexa occurring naturally on our property, Yallaroo. This form develops into a small, mounded shrub that reaches a height of one metre. Leaves are broadly heart-shaped with prominent raised dots. Pairs of leaves enclose the greenish yellow, long narrow, tubular flowers. Blooms are carried in autumn and winter. In cultivation tip pruning improves the shape of this hardy shrub. The second form comes from areas around the Guyra and Torrington areas in northern New South Wales. This form is identical to the “Yallaroo” form except that the flowers are dull red in colour. 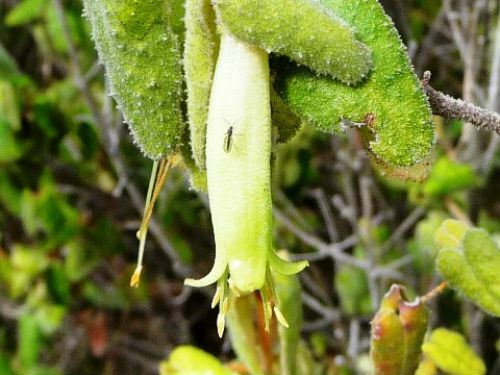 Within these populations there are also greenish yellow flowered plants. Both forms, as with most Correas, propagate readily from cuttings.